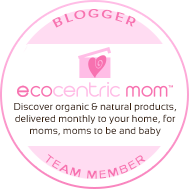 Have I mentioned how much I love my monthly subscription box from ecocentric mom? Each month I get a little box full of eco-friendly goodies for me (and sometimes a few to share with friends, family, and the kids). For August I decided to try something different, instead of the mom box I got the mom & baby discovery box. I have a few friends who are pregnant and the little baby items will make cute gifts. gao. A natural wooden fish teether from Liku Gao on Etsy. Nature’s Baby Organics. Shampoo, Body Wash, Conditioner, Detangler, and aromatherapy calming spray. The light scents of vanilla tangerine and lovely lavender are so sweet and calming. Rubbabu Natural Rubber Foam Toys. I’m actually considering keeping these as stress relief balls for myself. Did you know that Rubbabu is the World’s only rubber foam toy maker? Truebar by Bakery on Main. The ecocentric mom box would not be complete without a little treat for mom to nibble on. As a busy mom it’s great to have a healthy snack bar to fill your belly when you’re on the go. I love the chia seeds. To see the rest of the contents or to subscribe to see what next month’s box includes, visit ecocentric mom and sign up! The mom & baby discovery box would make a wonderful suprise baby gift for a new mom. Disclosure: I am an ecocentric mom blogger! I receive a mystery box each month for the purpose of this review. My opinions are honest, my own, and not that of the company.